As the current emperor of the Shi’Ar, former Xavier student Vulcan (brother to Cyclops and Havok) is overseeing a particularly troublesome time for his people. His reign, already unpopular among the masses, falls right in the middle of a cultural war. A new race of aliens, known as the Scy’Ar Tal, is moving against his empire. They’ve unleashed a “doomsday device,” destroying an entire planet and the billions living there, and are now threatening the very existence of all reality. Facing overwhelming odds, Vulcan has swallowed his pride and called on Havok for help. The X-Men’s fascination with the politics, warfare and civilization of alien races is something I’ve never been able to really enjoy. When the subject has been used properly, as in the legendary (but over-referenced) Dark Phoenix Saga, that fixation has yielded tremendous results. When it’s been misused, it’s produced nothing but excessive amounts of skin colors and overcomplicated, dull stories. Emperor Vulcan is, unsurprisingly, much more of the latter than the former. This story is filled to the brim with hyperbole, dialog that only serves to keep its characters relevant. 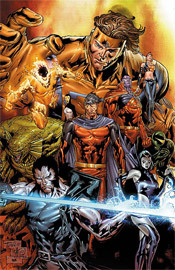 Where the book highlights almost two-dozen characters, no more than three or four are integral to the issue’s plot. The rest merely hang around and produce rambling, unnecessary contributions to the conversation and, supposedly, give the story additional depth. I think Christopher Yost expected that, by increasing the head count, he could give this story that sense of intergalactic necessity and scale. It doesn’t work. I never felt the galaxy was in any kind of peril, even if the Scy’Ar Tal were threatening to destroy the planet holding the almighty M’Kraan crystal. I’d never even heard of the thing before this issue’s introduction, and I’m sure I’m not in the minority there. If you’re catering to a niche audience (X-Men fans) and only a fraction of that audience has a clue about the impetus behind this story, then you’re targeting a niche within that niche. It’s elaboration into a corner of the X-universe that I think would’ve been better off left untouched. Paco Dia Luque’s pencils continue that theme. They provide the reader with detail on top of detail, but lack the personal touch and excitement that’s crucial to any comic’s success. When he sketches Havok’s team, sitting around a table to discuss Vulcan’s proposed truce, they’re just sitting around a table. There’s no life to the proceedings, nothing to entertain the reader while these characters ramble on and on about the benefits and pitfalls of such an alliance. Even when the team charges into action, powers flaring, it’s not an exciting read. If anything, it’s even more humdrum. It’s awful work, but I guess I should be glad that it’s relegated to an awful book, rather than murking up the efforts of a better writer. This is a miserable series, dealing with characters who weren’t interesting enough to land a regular spot on one of the main X-Men books. The story is confusing and unrewarding, the artwork is second rate and dry, and ultimately the only thing that drove me to finish the issue was a commitment to finish this review honestly. Skip this, for all that’s holy. Don’t give Marvel a reason to produce a sequel.